I’ve recently read a lot of articles, tweets, and so on about girls not finding female characters in games, movies, etc. I have a geeky daughter, and I’m painfully aware of how common this is. And while she’s not necessarily opposed to playing male characters, she definitely prefers to play a female character when possible. Iron Man, Hulk, Captain America, Thor, even Hawkeye. Where’s Black Widow? 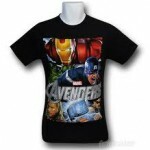 My girl loves The Avengers—the movie itself offers characters like Black Widow and Maria Hill, both of whom she likes. The merchandise, however, rarely includes Black Widow unless there are at least 5 characters depicted, and she’s usually off to the side or sort of in the background. Absolutely nothing I’ve found features her, unlike Iron Man, Thor, Captain America, and to a lesser extent the Hulk. (Admittedly, Hawkeye is equally excluded—one could argue that you don’t get your own notebook or water bottle until you’ve also gotten your own movie…but that just points out another problem.) You can only get the Black Widow Lego minifig as part of a $70 set. Speaking of Lego, The Hobbit and The Lord of the Rings are pretty big in our house, too. I know these settings are sorely lacking in female characters. But Lego really couldn’t have included Eowyn in The Battle of Helm’s Deep? Or included Arwen and her horse with Attack on Weathertop? These oversights in other media make the Skylanders games stand out all the more because of their inclusion of multiple female characters. Skylanders has kind of taken over our house, but in general I’m happy to let it happen. A quick overview: Skylanders (Spyro’s Adventure and Giants) is a line of video games that uses physical collectible figures. Part of what’s so cool is that each figure stores its own information, so you can take your figure to a friend’s house and still play your own specialized character on your friend’s game. (Here’s a better detailed and more technical explanation.) There are also several app games where you can enter the codes from each figure and play those characters on your iPad or whatever. Caveat: I have to admit that my experience with the game is mostly second hand—I talk with my kids about it, together we choose new characters to buy, I’m in the room when they play but not actually paying a ton of attention. (Although I am totally addicted to one of the app games, which uses the same characters—when the kids buy a new figure, I get a new character in my game! Truly, this is brilliant marketing.) I haven’t given this intense academic study and my observations are primarily based on the experiences of my family and the families of some friends. It’s true that significantly less than half of the characters are female (only about 25%), and it’s possible, even probable, that if I really examined some of the portrayals, I’d find something problematic (although I bet I’d also find male stereotypes that would bother me). But the thing that I love is that there are a variety of female characters—even at 25%, that means about 10 individual and differentiated female characters. These aren’t things you have to unlock; if you want, you can start the game with an all-female party because you purchase the figures for the characters you want to play. These aren’t just token females, throwing a pink sparkly bone to some girl who might want to play. These are cool and unique characters. There are purple male characters and blue female characters. Yes, one of them is a unicorn dragon hybrid who shoots lethal rainbows out of her horn, but that’s awesome, too. The female characters don’t have to give up feminine characteristics in order to be effective. When we were first getting acquainted with the game, several male clerks in various game stores mentioned that Stealth Elf was the best character from the first series, meaning that the coveted character is a female ninja. My daughter is mixed on video games—she plays a bit, but it’s not a major interest for her. 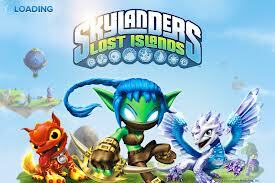 But Skylanders, with cool female characters and collectible figures, has grabbed her attention. No, she doesn’t play it as much as her brother does. But she does play it and she does spend her allowance on new figures. A friend of mine is the mother of three boys. She doesn’t play a lot of video games, but when she saw the female Skylanders, she bought herself a figure and she plays with her sons. Sprocket ended up under our Christmas tree, too. 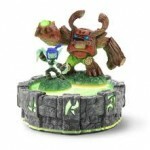 During the holidays, Skylanders Giants descended on many houses. Over at our friends’ house, they showed us three of their new Skylanders—my friend got Chill, the winter warrior. Her husband got Sprocket who is armed with a huge wrench. And their middle son got the gem dragon Flashwing. It just so happens that all three of those characters are female. It wasn’t planned that way—they just chose the cool characters that most appealed to them. I have WAY too much fun with this game. I don’t play the video game, but I’m totally addicted to Lost Islands, a Skylanders resource management game for the iPad. The title page for that game features Stealth Elf and Flashwing prominently. 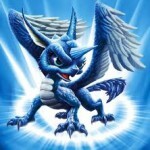 There are bios for each of the Skylanders, which my daughter has devoured and memorized. These provide motivations for all the characters, which engages her imagination and helps draw her into the world of the video game. She particularly likes that Sprocket is searching for her missing uncle—I think it reminds her of the plots of some of the books she’s enjoyed. 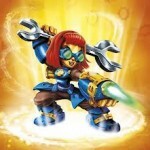 I’m not going to say that Skylanders is perfect—there are some weird gender dynamics between two NPCs (the buffoon pilot routinely and ineffectually hits on the female combat instructor)—but in a world where it seems particularly hard for geeky girls to find characters they can identify with, it really stands out as an example of where I hope we’re headed. And based on my personal experiences, characters being female has in no way discouraged male players from buying and playing them, and in several instances it has drawn in female players who otherwise might have ignored the game. This entry was posted in Games, Kids and Gaming, Parenthood. Bookmark the permalink. I totally would have swapped Arwen for one of the Ringwraiths in the AoW set (yes, I also got some geeky xmas gifts!). On a related note, when I was young and frustrated by the lack of “girl” Lego figs, my mother wrote a Strongly Worded Letter to Lego, asking them why they didn’t include more female characters, since I loved Lego just as much as my older brother. Lo and behold, Lego actually wrote back and sent an unexpected pack of about 10 female minifigs. Their letter was conciliatory, and did mention a new line of girl-friendly lego coming soon (as if I cared about a pink bucket), but hey, more girl figs! Don’t know if they’d do the same now, but it proves that sometimes companies do listen to customers. Overall, I really like Lego as a company, thus they continue to get a substantial portion of our budget every year! 🙂 Maybe I will write to them, because it bugs me that female minifigs are so rare. Lego Friends are fine, but my daughter wants to play with the massive number of Lego sets already cluttering up our house. When I was growing up in the 80s, we had exactly two ways to make our Legos into girls: we had one of those ugly pointed princess hats, and we had a single piece of Robin Hood hair, that my sister and I absolutely warred over. In the end I cut off some of my own hair and glued it to a blue ballcap piece, so my “me” Lego had a ponytail. I have issues with the new “for-girls” Lego sets, but my god, at least now you don’t have to donate your DNA just so your lady minifigs can have a decent haircut. Another interesting one is Wizard101. You can create female or male characters and they all have access to the same spells, cards, abilities, pets, etc. And pets range from pigs to dragons to unicorns. My son and I sometimes sit side-by-side with separate computers to play together. Hopefully the genre is growing…what marketer wants to miss out on the female disposable income cash cow? Truly, get the moms involved in the games, and you’ve won. You’d think more marketers would be aware of this! The girl Legos were not out during the period of time my girls would have gotten into them because I looked – extensively! I know some girls don’t care, but my middle girl would have *totally* been into it if they had the pink Legos at the right age for her.